John Milito's Amazing Adventures: Two Lost Dudes and the Assembly of the Dead! While we did a little bit of wandering in Marrakesh's Medina yesterday, today we were much more purposeful, and pinpointed a couple of awesome sounding sights to see. I also read that eating dinner there was a memorable experience so I was excited to do that. Once we were back inside the maze of market passageways navigating was pretty enjoyable. There were no street signs, so I balanced my phone's GPS with the guidebook's map and just figured it out. Our first stop was Bahia Palace. My favorite story about this place was that the locals used to host the French here, and the French liked it so much that they booted the palace's owners and claimed it as their headquarters. Now that's just bad manners. 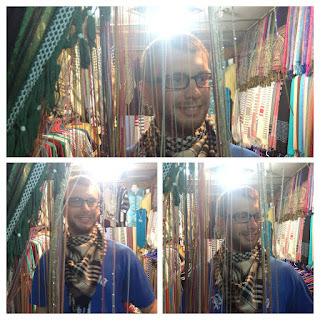 Evan picked up a sweet scarf while we navigated the market. 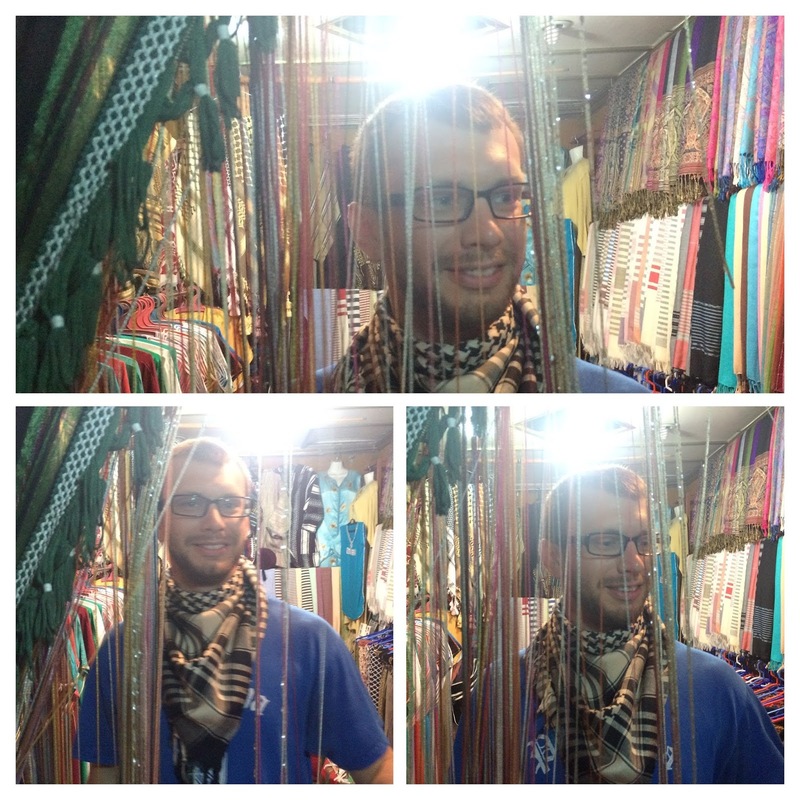 The merchant was super funny because he got us in the with the cheap price of one scarf, then once we were inside immediately confessed that that scarf was crap and what we really needed was another more expensive scarf. As annoying as they could sometimes be they were downright charming compared to the treatment we received from merchants in Senegal and Gambia. One of my own personal hustles is to ask anyone that I buy anything from ever if I can take a picture with them or with their awesome hat. They must feel obligated because no one ever says no. Next we headed over to another awesomely decorated place called Dar Si Said which now houses the Museum of Moroccan Arts. There were a few of these silver headresses worn by Berber Jewish women on display that I appreciated. Also I'm sort of impressed that Berber Jewish women is a group of people. You know how it would be awesome if babies could like, ride a rickety wooden Ferris Wheel unattended but "laws" and the "mainstream media" and "your conscience" says that's not ok? Well old school Morocco ain't concerned with any of that crap. The main square is named the Place Djemaa El Fna, which awesomely translates to "assembly of the dead" as it was once the site of public executions. I wanted like TWO cookies but misread the sign and ended up with this box full of assorted pastries. Sigh. Once I was done paying for them the guy was like "those cookies are just flour and sugar. My friend over here has the REAL good cookies made from PISTACHIO!" Luckily for that dude my choking hand had a box of cookies in it. "Situated in the very heart of the souks, this building is a hidden secret, only found by the discerning and curious visitor, where history is recorded in the delicate tracery of the stucco and skilfully carved wood. In the year 2000 , Marrakech Riads, a leading player in the restoration of the riads of Marrakech, brought Dar Cherifa back to life, and simultaneously unveiled a hidden treasure of the medina, the refined decor of this building recalling that of the Medersa Ben Youssef, jewel of the Saadian era (16th century) and one of the finest monuments of Marrakech. Renovated with the greatest care and attention to detail, with the participation of renowned craftsmen so as to maintain its authenticity and splendour, Dar Cherifa welcomes all visitors eager to meet new and interesting people. It is a real cultural venue, hosting regular exhibitions, workshops, concerts and events. This inimitable space draws one into a meditative state of mind and heart. Everyone fortunate enough to visit this building says that they breathe an atmosphere of peace and serenity the minute they cross the threshold. The mention of Moroccan culture immediately implies Moroccan cuisine, and what more beguiling setting than this pure and refined interior for sampling a cuisine abounding in cultural exchange; a subtle blend of sweet and sour, the inheritance of Berber, Jewish and Arab-Andalucian influences. Enjoy!" Not only is Moroccan mint tea awesome but often when you order it they do these trick pours. Finally we made it back to the Assembly of Death! The place had transformed from the times we'd passed through here earlier. Now it was full of street performers of all types, each surrounded by a circle of viewers. I've read it described as real life channel surfing, because as soon as you got bored with one act you could easily bounce to the next. Man this area is annoying. There were stall after stall of guys grilling meat, which is awesome, but since they were all selling the exact same product they were now resorting to who could be the most annoying salesman. They'd follow you, thrusting a menu into your hands. Some even had little song and dance numbers to draw attention. It was fun but it was definitely setting off my flight response. Too many hucksters in one place! We sat a little place on the edge of the mayhem and had some kebabs. It was really fun watching the touts pester every passerby to eat something. They were really tireless. For dessert I thought it would be best if we had a bowl full of snails. They tasted kind of like sauteed mushrooms, and had a similar texture as well... kind of shriveled and meaty with a buttery taste to boot. Animals: don't be slow and delicious around John Milito. I'll come at you bro! This one still had its little antlers and everything. A few of mine had things to say to Evan in high pitched voices. Snails are so weird. A couple of French people sat in the seats next to us and I quizzed them on what they thought about the whole thing. Despite the well known French proclivity for snail eating they thought these were weird as well. Also, if you haven't heard a French person pronounce "St. Louis" then you aren't really living. I snapped a picture of an act in progress, and somehow they saw and ran after me with a hat wanting me to pay. I threw in a couple nickles I had in my pocket. The guy looked at the money and said it wasn't enough. I walked away. It was my last night with Evan. I think we made it a good one. The cleanup crews were rocking giant vacuums. The hotel at night looked pretty swanky.